As most of you know (and as I’ve said above), I played World of Warcraft. Before WoW, I played Diablo II, Morrowind, and Oblivion. Through all of these rpgs, I have played mostly male characters. 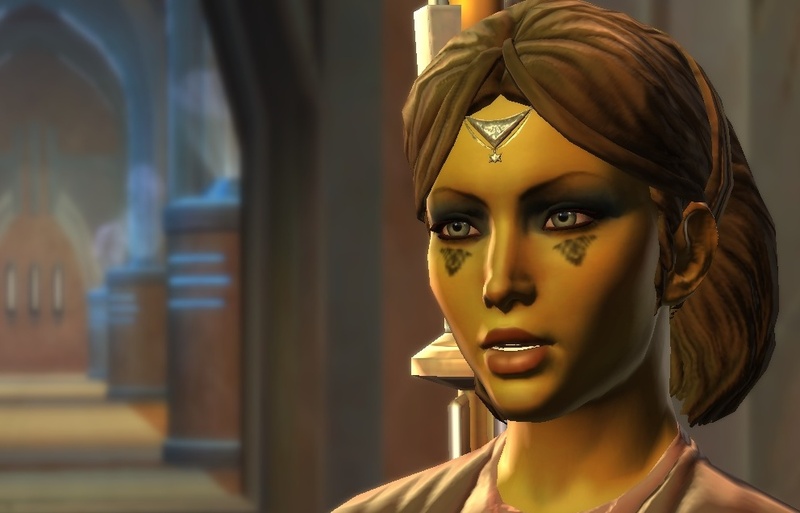 In the KotORs, my first Revan and Exile was a male (funny how she the Exile (Meetra Surik) is female according to canon. Nice for a change, as opposed to Revan and Jaden Korr (Jedi Academy).) 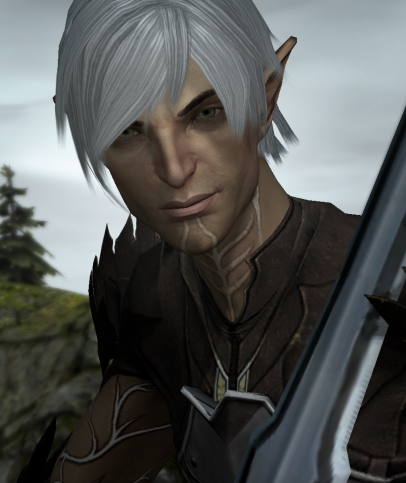 My Dragon Age: Origins Warden was a City Elf male, and my favored Hawke was a male Rogue. My current Jedi, Sith Marauder, and future Miraluka Mercenary are all males. I am in no small way a role-player of male characters. I figured I’d preface what I have to say with that. Despite these facts, I have also played my share of female characters in RPGs. I believe this first started when my only option in Diablo II to play a mage-type character was the Sorceress (Necromancer doesn’t count!). It was around this time the Lord of the Rings movies came out, and I began writing my fantasy epic story. As I’ve developed the plot and my characters, I figured getting to understand the complexity of the female gender might be pursued by story-driven elements of the RPGs. It’s one thing to know actual women, but at that age I really couldn’t get my head around how any “real life knowledge” might be applied to the fantasy epic setting. Now, this is of course problematic, and in so many ways is fallible. I realize many women characters in media are written by men. However, in a lot of ways, I pushed to try to pursue my actions and experiences from a different perspective than I was used to. Despite these motives (and my obsessive need to justify myself in my defense), I was repeatedly made fun of, even by my best friends. I was repeatedly called a number of things, which may or may not have been true. Yet, the pursuit did not stop. Now, especially when it came to WoW, I never impersonated an actual female person when I played one. Granted, I asked for a strata of stupidity I’d never before understood when I chose to play Night Elves for a brief moment. That phase ended really fast (mailbox dancers, anyone?). After enough incredibly awkward propositions, I kept to playing men. When Burning Crusade rolled around, I created three female Blood Elves. Again, I kind of asked for it. However, it didn’t turn out so bad. If you read my intro post, I talked about a Shadow Priest and Retribution Paladin I played. Yup. Both Blood Elf females. I also made a mage named Toastadora…with intent to get the Explorer achievement. I know, I’m so punny. 1. My wife, who ALWAYS plays female characters, plays with me and never has had a problem with me playing females. And no, we don’t do creepy things on the internet. 2. Now, in SWTOR, I have Rhyla my 50 Scoundrel and Kaytra my 50 Sorcerer, as well my Vanguard Rheymi and Sage Shoraay well on their way up. I’ve also heard that a particular gentlemen played a Tauren male in World of Warcraft because he liked to watch the tail swing back and forth as he ran. Just remember, guys, the character you play is not your girlfriend. Sorry. Let’s face it, some games are more interesting if you play both a male and a female character…ie. Just about anything Bioware…and increasingly more as they make more games. It’s a different experience on play-through, whether minor or not. Personally, it doesn’t matter to me whether you’re a guy or a girl, I’ll treat you the same in-game, but there are those out there more inclined to help out girls in need. Just don’t get on Ventrilo without a girl next to you with the microphone repeating everything you say. And if playing behind an avatar wasn’t enough, now you are playing the opposite gender. Now make sure you don’t share your password and credit card information. Oh, and again, don’t bother getting on Ventrilo. I’m going to leave it at that. I’ve met enough people and have had enough awkward propositional whispers to know that while this doesn’t seem to be the most common response, deviate behavior exists in this realm. Granted, some argue that a guy playing a girl character is evidence enough, and is in fact based upon this. I can only disagree, however, in my own case. I have experienced this, and am not the only one. Guess what, she got her own account. Oh, and what’s more? We’re married. Epic Win. Just learn from all the poor saps who shared an account with their girlfriend and got their characters deleted for any number of reasons. Be careful. And log her in yourself…don’t give her your password. Then again, if you do, you could become an internet sensation known for taking out your temper on inanimate objects OVER inanimate objects. Your choice, I guess. Potential Stigma: …really don’t have one for this. Honestly. I like seven points, and this point is included for anything I missed. Please feel free to comment. Here’s my own perspective on it. As a writer, I look for inspiration in crafting characters from three sources: people around me, from pre-existing characters in other media, and from engrossing myself into a character in an RPG. For reason three, it comes from not only as a means to an end, mind you, but also in an enjoyment of experiencing a story in which a character exists…either male or female. I am writing this character’s destiny as I go, and no one thus far in my own experience grants me this freedom as well as Bioware. (Though, I haven’t played Skyrim yet.) Women characters, to me, are as interesting as men characters. Also, the way I “roleplay”, my characters are involved and connected somehow. Luckily, the Legacy system in Swtor has helped encourage that. I see my characters as characters in my story, not as an incarnation of myself. Also, I’m a sucker for romances. While there is enough disconnect for me (as I myself am not involved in this romance), I like watching them unfold. Like I’m writing a love story. My favorite romance story in-game so far was in Dragon Age II, with a female Hawke pursuing a romance with Fenris. To me, this was the benefit of playing a female character, getting to see another side to characters that I otherwise wouldn’t have. Since I’ve played SWTOR, I’ve only had the opportunity to pursue two at the moment, and only chose to pursue one (Rhyla/ Corso Riggs). Some say romances and love interests are overrated. Some make them out to be more than they really are. They are an interesting part, and can be an important part of the character’s story. I say, when done right, they are the icing on the cake. I love icing. No one likes a stalker. Not even these kind. That’s about all I have. Go, Fight, Win!…and please don’t take an arrow to the knee. I made a female character for one simple reason: Who, if they ever saw the movie Aliens, would not try to make a female commando? I named her Vas’kez (I know, I know). I love playing that character, although I wish they had put more “tough girl” language in for the female trooper. (Hudson: “Hey Vasquez, have you ever been mistaken for a man?” Vasquez: “No, have you?”) Of course, I sometimes also yell “Let’s Rock!” when I open up with the assault cannon! Great article! I use to always play male characters, until game studios began giving us more compelling RPG storylines. For instance, I play both male and female characters in most BioWare games, because the perspective is different. The interaction, friendships, etc between the other characters should be impacted by the gender of your character. Not that one gender should be better than another, but it is more real to have those differences. As a writer, I love to see how they treat the genders in the storylines and how NPCs interact. This makes for a better game experience for myself. Hey, Jason. Thanks for the comment! And I feel ya, when the storyline is compelling, it can be easy to get interested and play both genders. Bioware, for instance, did a great job and I feel like I had two considerably different playthroughs while playing a male and a female. Add to that the ability to define your own personality and a considerable amount of important choices, and the replay value increases. Good to hear from a fellow writer. Thanks again! I ran into this while looking up images on Google and must say you’ve written what iv’e been thinking for a long time, i myself have never played a female character and have never had a craving for it as i usually create a male character because they’re strong and tough and it makes me feel like one of those heroes we’ve grown up to love and admire. I don’t have a problem with guys who play female characters but iv’e run into some strange ones, their are men who will only play female characters and use female avatars which is a bit strange IMO and their are men who will play a female character and give them a very sexual/perverted name. Big Project Incoming… New Projects!